RSSBus Connect can seamlessly link Quickbooks to Salesforce. 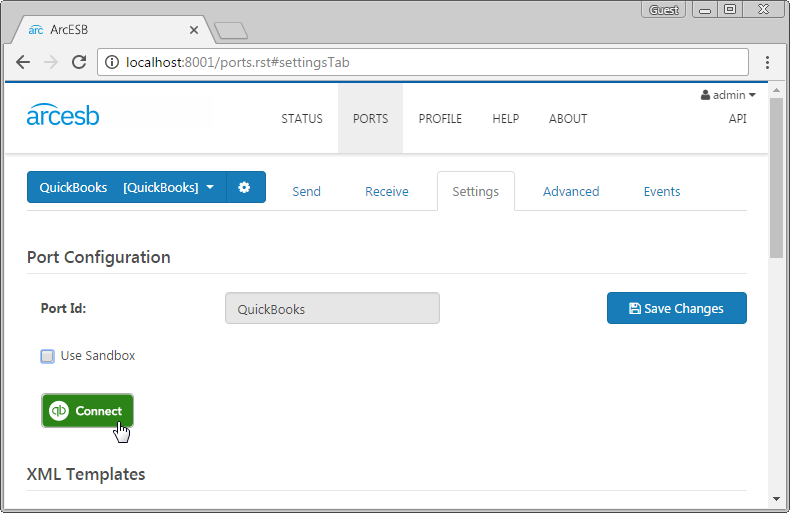 The following sample project demonstrates how you can use different ports in RSSBus Connect to automate the process of taking a QuickBooks Online Customer and inserting it into Salesforce as an Account. The sample will poll QuickBooks for new Customer records and upsert them into Salesforce. Click the green QuickBooks Connect button to open an OAuth session with Quickbooks and configure the email or user ID and password fields on the QuickBooks website. The QuickBooks port has been configured with a default output template for QuickBooks Customers. 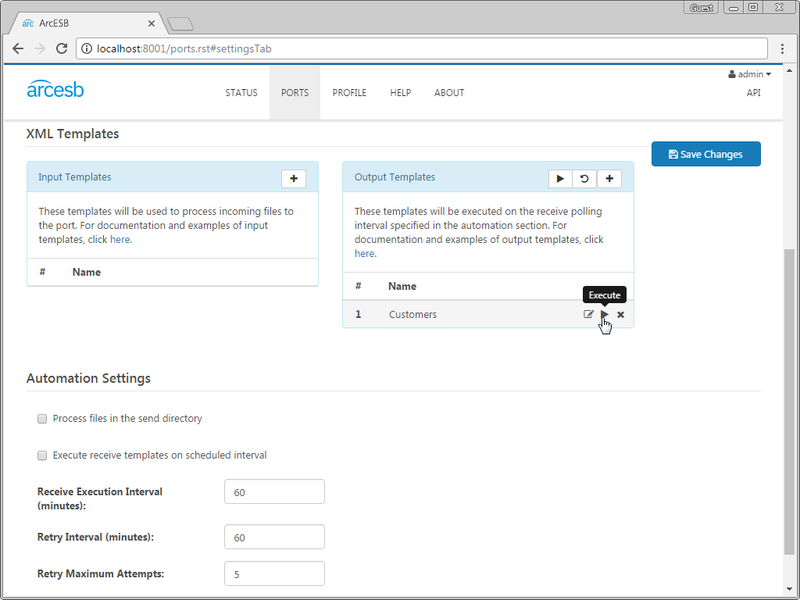 This template has been configured to poll QuickBooks for new Customers that have been added to QuickBooks within the past 24 hours. The application will generate a new XML file for each row in the database that is processed. If you open the template file, you can view the logic controlling the query, where the setting skipProcessedRows='true' prevents the application from pulling in data that has been previously retrieved and WHERE MetaData_LastUpdatedTime >= DATEADD('day', -1, GETDATE()) limits the query to the most recent data. You can click the run symbol next to an individual template to run that specific query, or click the run symbol in the Output Templates window to run all of them in succession. The port has already been configured to poll the Salesforce account on a scheduled interval, which can be seen in the Settings tab under the Automation Settings section. Once the port has retrieved the data and generated an XML file, the result will be sent to the MAP_QB_to_SF port. The mapping port MAP_QB_to_SF can be used to convert the XML file containing the QuickBooks Customer into an XML file with values and tags matching the template for a Salesforce Account. When output file from the QuickBooks port has been placed into the mapping port�s Send folder, clicking the Send button will process the file. 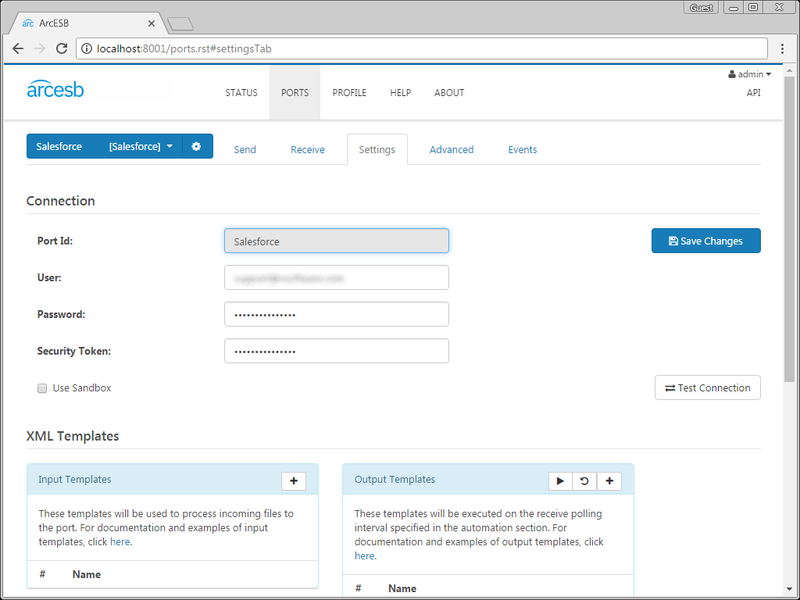 After converting the file to match the columns in the Salesforce database, the XML file that is generated will be automatically sent to the Salesforce port to await further processing. Configure the username, password, and account ID fields in the Salesforce port Settings tab to connect to Salesforce. 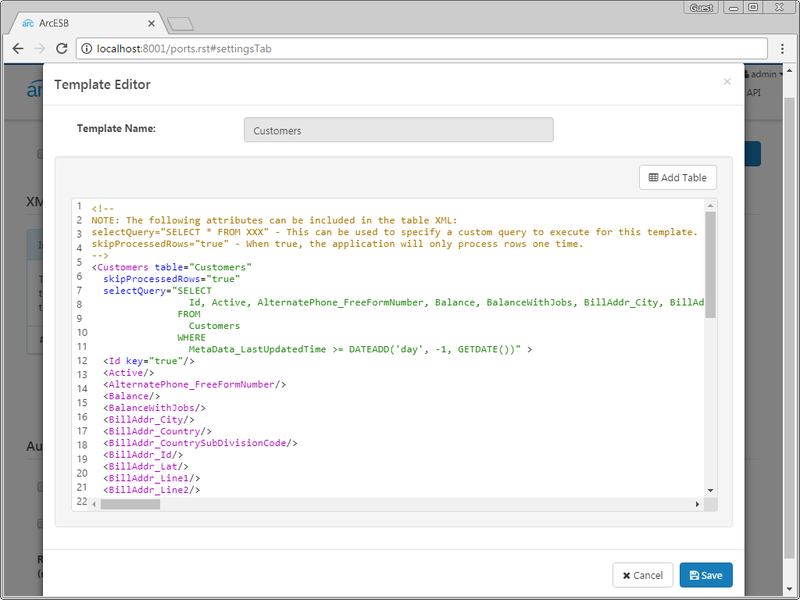 In your Salesforce port, you can use new XML file found in your Send folder to either insert or update customer records in Salesforce. In the upload template, you can specify a key to be used to determine whether the entry will be inserted or updated. RSSBus Connect will compare the value set as the key to the existing entries in your Salesforce account. RSSBus Connect first checks to see if there is any Account record in Salesforce where the Name matches the Customer from QuickBooks, as these columns are used to uniquely identify an Account and Customer. If there is already such a record, the application updates the record with the new data. If there is no matching record, the application instead inserts the record into Salesforce. Just like with the QuickBooks port, this port has already been configured to automatically process new files added to the Send folder. You can view these options in the Settings tab under the Automation Settings section. 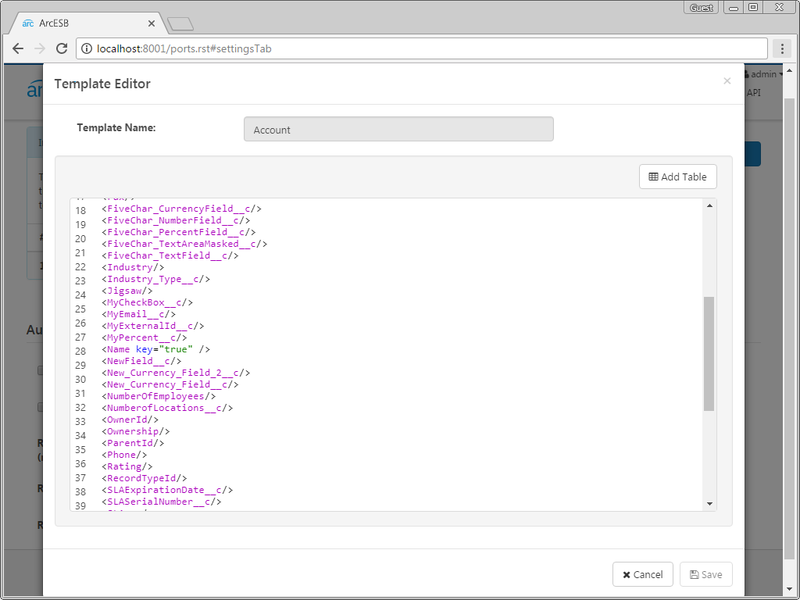 As you can see, with RSSBus Connect, it is possible to automate your cloud data accounts, integrating QuickBooks Online data directly into Salesforce. RSSBus Connect also enables many more Quickbooks to Salesforce (and vice-versa) automations. For more information on RSSBus Connect, visit our home page. Download your free, 30-day trial and start controlling your business document exchange today!